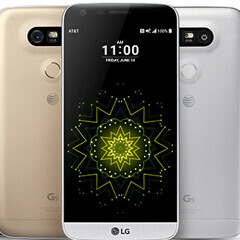 LG today announced the G5, its latest flagship smartphone, which represents a new direction for the company, as it comes with a modular, metallic design. LG said that the new device would be available around the world starting April, but didn't provide specific details. In case you're wondering where in the US you'll be able to buy the LG G5, we have the answer: Verizon, AT&T, and Sprint all confirmed that they'd carry the smartphone. Verizon will start selling the LG G5 sometime "this spring", for an unknown price. AT&T and Sprint said that they would reveal the launch date and price of the new device in the coming weeks (we're expecting both carriers to release it at about the same time as Verizon anyway). It looks like AT&T and Sprint will have all four color variants of the G5 - Silver, Gold, Titan, and Pink - while Verizon is going to offer only the Titan and Silver ones. Update: T-Mobile reached out to let us know that it, too, will be carrying the LG G5. Pricing and other details will be revealed at a later date. Are you planning to buy LG's newest flagship smartphone? To help you decide, check out our LG G5 hands-on (video included), our LG G5 specs review, and all the new features that the G5 is introducing. Did you really use the work "dope"? Verizon really needs this. Their choice of phones has become very limiting. I like their service a lot, but being so limited in phone choice has been tough. Thisbis very doubtful but I would LOVE for this phone to be put on boost mobile, I will pay for price, this phone is badass, I will wait a few hours to see the s7 though..
You're willing to dish out $600 for a phone but are still on boost mobile? I think I'm in love with this phone! I'll never understand why Android OEMs let carriers call the shots on when they can launch their phones. My biggest complaint about Android is carrier branding. Because OEMs need carriers to boost their sale, otherwise you can see how Sony failed. And most majors carriers want OEMs to have theirs bloatware in the devices.